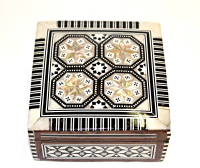 Mother of Pearl Marquetry Box. 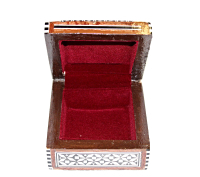 Size : 4.25" x 4.25" x 2"
Size : 5" x 3.5" x 2"
Size : 3.5" x 2.5" x 1.5"
Size : 2.5" x 2.5" x 1.5"
Size: 3.25" x 3.25" x 1.25"
Size : 6.25" x 6.25" x 2.5"
Size : 6.625" x 6.625" x 1.625"
Hand embossed casket decorated with hand woven killim rug. 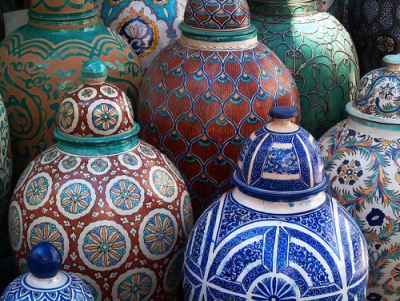 Made in Egypt. 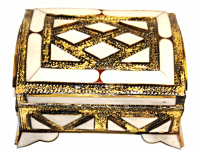 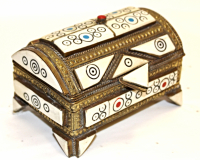 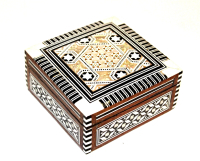 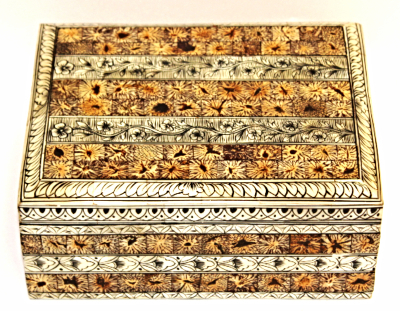 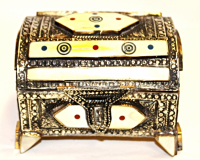 Size: 5" x 4.5" x 4"
Size: 16" x 12" x 11.5"
Size: 2.8" x 1.75" x 1.7"
Size: 2.8" x 1.5" x 1.38"
Beautifully Handmade Moroccan Camel Bone Jewelry Boxes and Caskets inlaid with hand carved, stained & polished Camel Bone and Hand Embossed Metal. 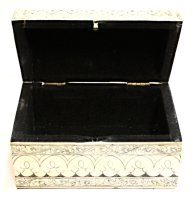 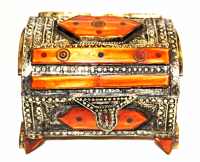 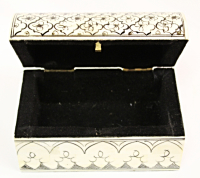 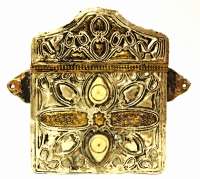 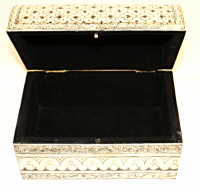 Casket with hand embossed metal and hand carved camel bone inlay. 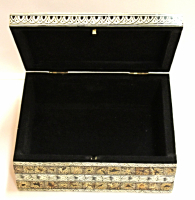 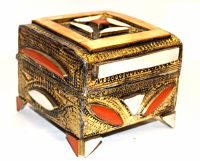 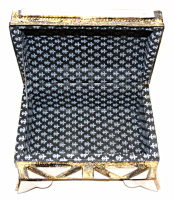 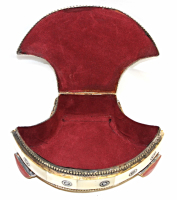 Casket with hand embossed metal and camel bone inlay. 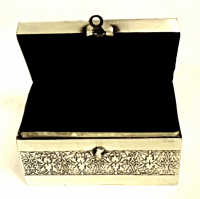 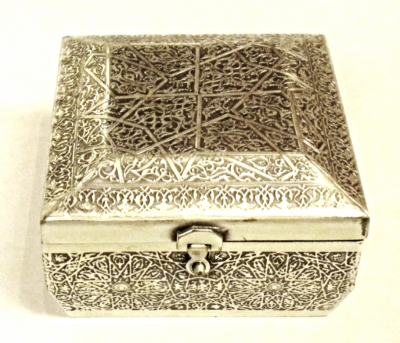 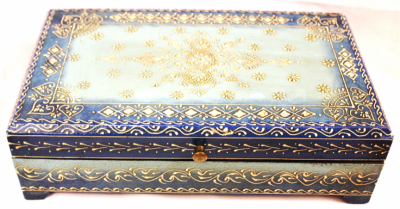 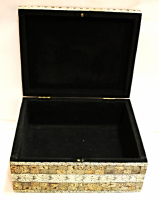 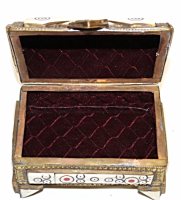 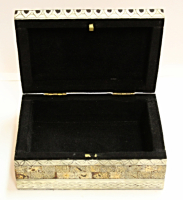 Size: 5" x 5" x 4"
Anique box for Koran with embossed metal and carved camel bone inlay. 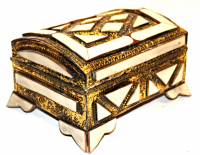 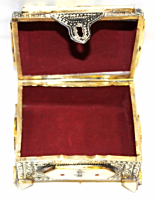 Size: 6.75" x 4.5" x 2"
Size: 9" x 4.75" x 6.5"
Handmade casket with embossed metal and carved camel bone inlay. 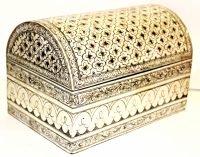 Size; 15.5" x 9" x 4.5 "
Handmade casket with embossed metal and camel bone inlay. 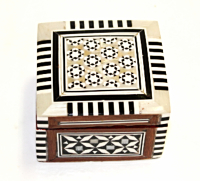 Size: 16" x 12" x 6.5"
These beautiful FUN puzzle boxes are handmade in Morocco from the rare thuja wood burl. 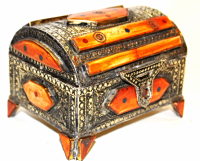 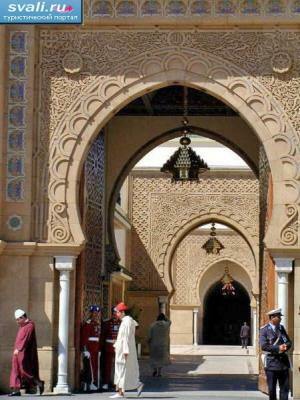 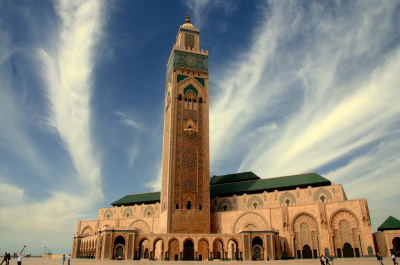 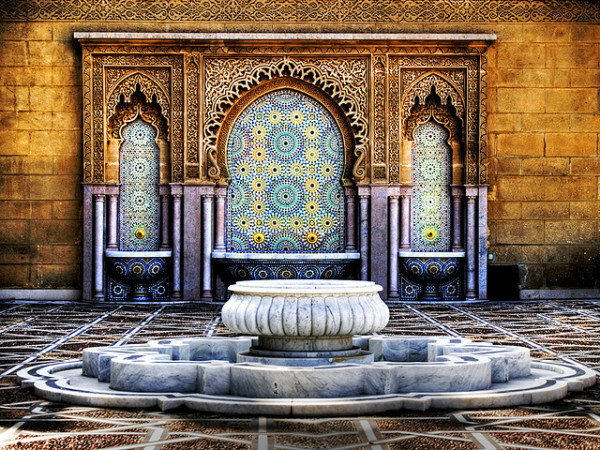 Thuja is related to cedar and has a wonderful aroma and only found in Morocco. 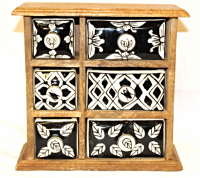 This makes a nice jewelry box and a perfect gift for family and friends. 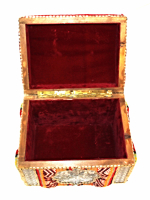 The trick is that the key is inside the box!! 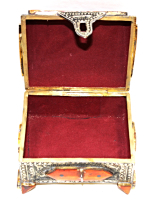 So you will have to use your imagination to get to the key so you can open the box. 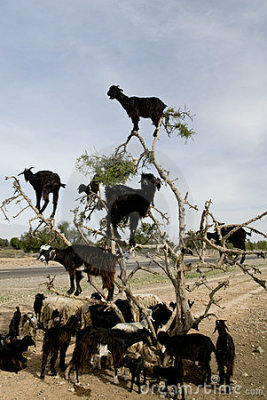 It's possible but it may be tricky. 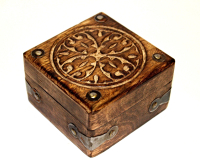 Just to help and you won't damage your box, there will be no pulling and no twisting. 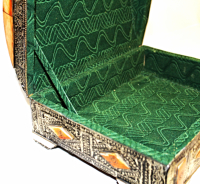 sliding only. 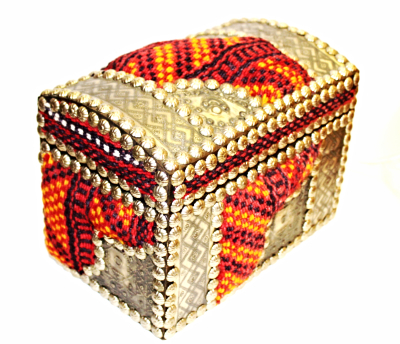 Handmade puzzle box (4 steps). 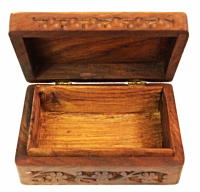 Made of aromatic cedar wood, decorated with wood inlay. 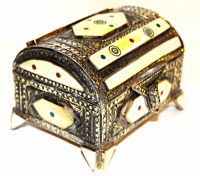 Size: 4.75" x 3.5" x 3.5"
Handmade puzzle box (1 step). 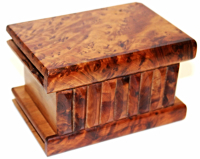 Made of a root of an aromatic cedar tree. 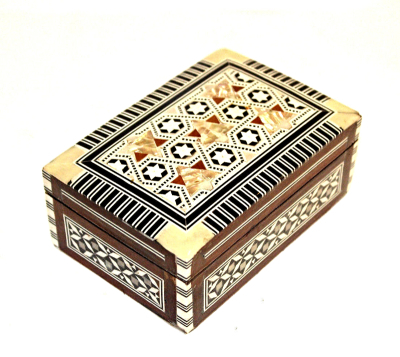 Size: 6.5" x 4.75" x 2.75"
Handmade puzzle box (1 step). 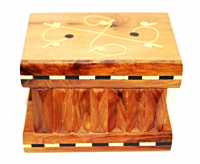 Made of a root of an aromatic cedar tree, decorated with wood inlay. 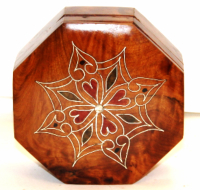 Handmade marquetry box. 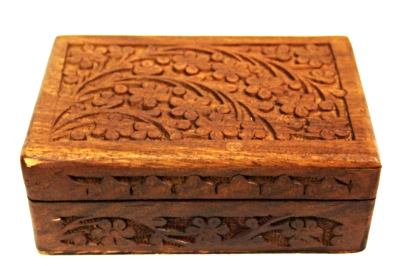 Made of a root of an aromatic cedar tree, decorated with wood and mother of perl. 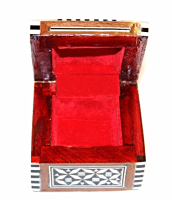 Size: 7.75" x 5" x 2"
aromatic cedar tree made in Morocco. 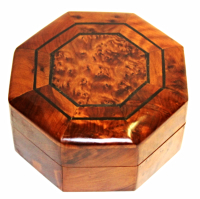 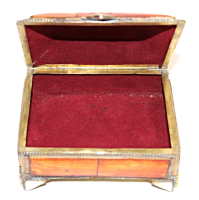 Size: 6.5" x 4.5" x 3"
Handmade octagon wooden box. 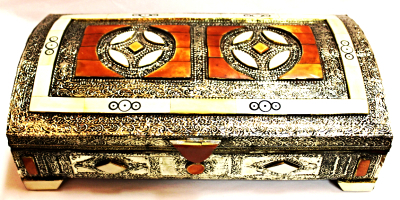 Made of a root of an aromatic cedar tree, decorated with silver wire and mother of pearl inlay. 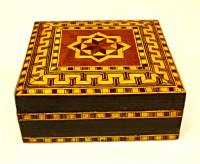 Size: 5.5" x 5.5" x 2.5"
Handmade marquetry box. 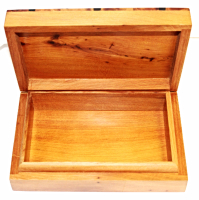 Made of a root of an aromatic cedar tree. 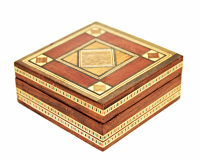 Size: 7.88" x 4.75" x 2.5"
Handmade marquetry octagon box. 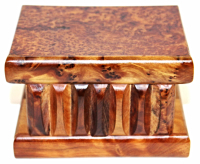 Made of a root of an aromatic cedar tree. 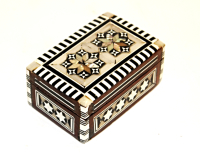 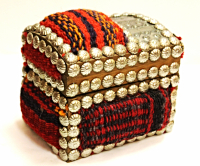 Size: 4.75" x 4.75" x 2.5"
Handmade puzzle box (4 steps). 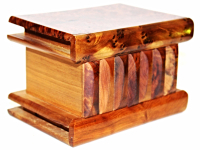 Made of a root of an aromatic cedar tree. 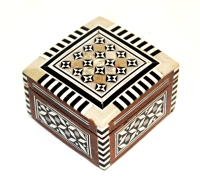 Size: 6.75" x 4.5" x 4"
Handmade puzzle box (4 steps). 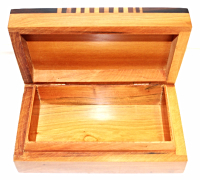 Made of aromatic cedar wood. 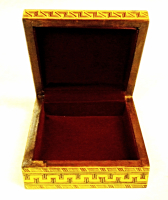 Size: 5.5" x 3.5" x 3.25"
Size: 4.5" x 3.5" x 3"
Beautifully Decorated Boxes, Caskets, and Chests from Thailand. 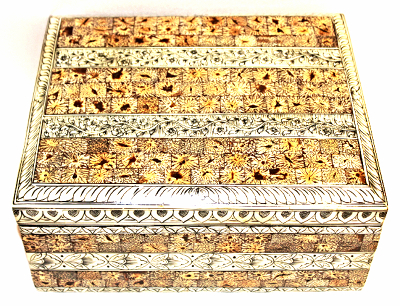 Handmade casket inlaid with tiny mirrors. 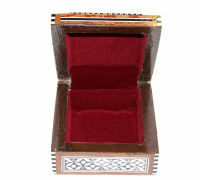 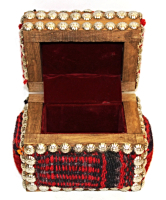 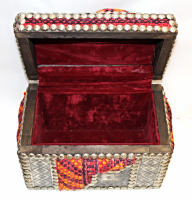 Size: 6" x 3.5" x 3.5"
Size: 10" x 6.5" x 6.5"
Carved Wooden Box with metal accents. 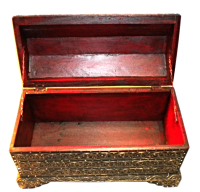 Wooden Box with 3 drawers and a door. 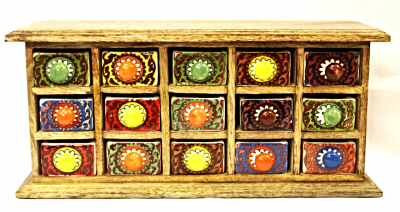 Size: 9.5" x 9.5" x 5"
Wooden Box with 6 ceramic painted drawers. 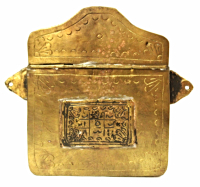 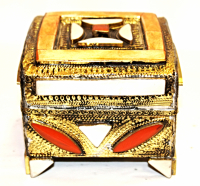 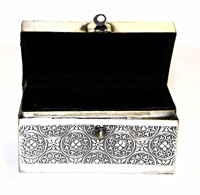 Size: 8.25" x 8.75" x 4"
Size: 8.25" x 5.25" x 3.25"
Metal Box with embossed design. 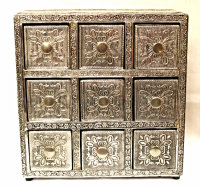 9 drawers. 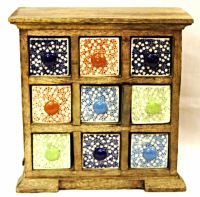 Size: 9" x 8.75" x 4.5"
Wooden Box with 9 ceramic painted drawers. 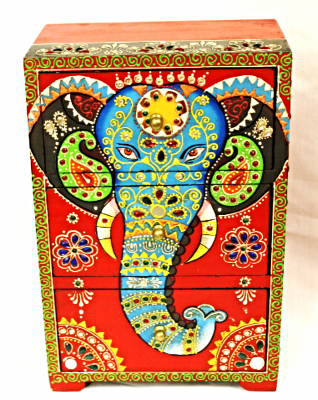 Size: 9.25" x 9.75" x 4.5"
Wooden Box with 15 ceramic painted drawers. 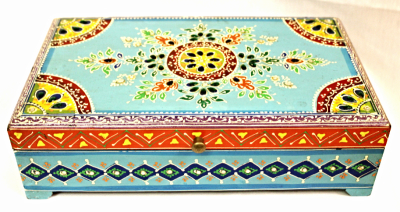 Size: 14" x 6.5" x 3.75"
Wooden Box with 3 ceramic painted drawers. 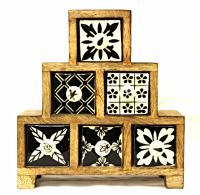 Size: 9.5" x 4.5" x 4.5"
Size: 10" x 3.25" x 4.5"
Wooden Box with 5 ceramic painted drawers. 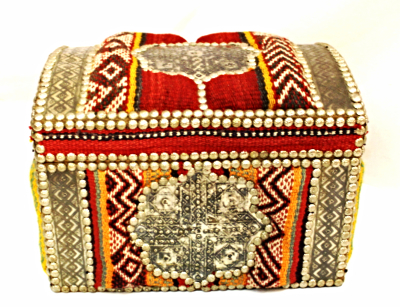 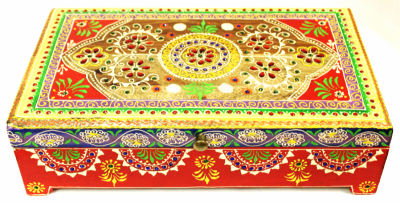 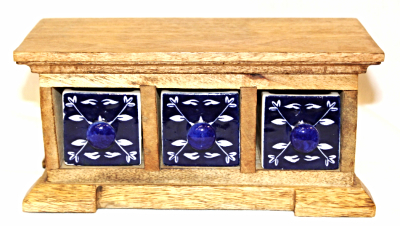 Hand painted Wooden Box with beads inlay. 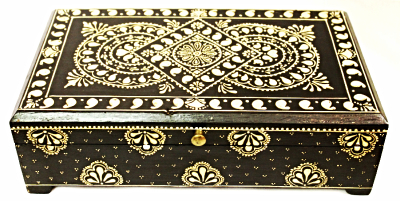 Size: 11.5" x 7.5" x 4.5"
Hand painted Wooden Box. 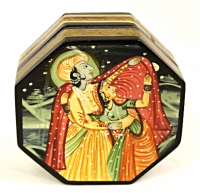 Krishna and his wife. 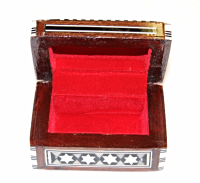 Size: 3.63" x 3.63" x 1.63"
Size: 13" x 8" x 4"
Size: 11" x 6" x 2.75"